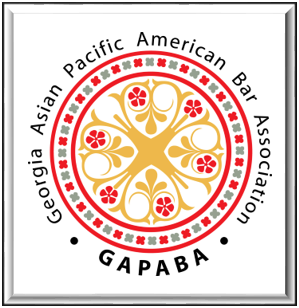 GAPABA hosts many events, including our Annual Gala, Lunar New Year Banquet, Professional Events, Public Service Panels, In-house Counsel Events, CLEs, Happy Hours, Family events, and much much more. Check out our calendar, and register for events below! 03/14/2019 GAPABA Women's Leadership Network KICKOFF Event! 02/27/2019 GAPABA SSF 2019 Kickoff Hoppy Hour! 11/09/2018 Events for #TeamGAPABA at #NAPABA2018! 11/03/2018 Law School Exam Workshop! 10/13/2018 #TEAMGAPABA joins #TEAWalk2018 at CPACS! 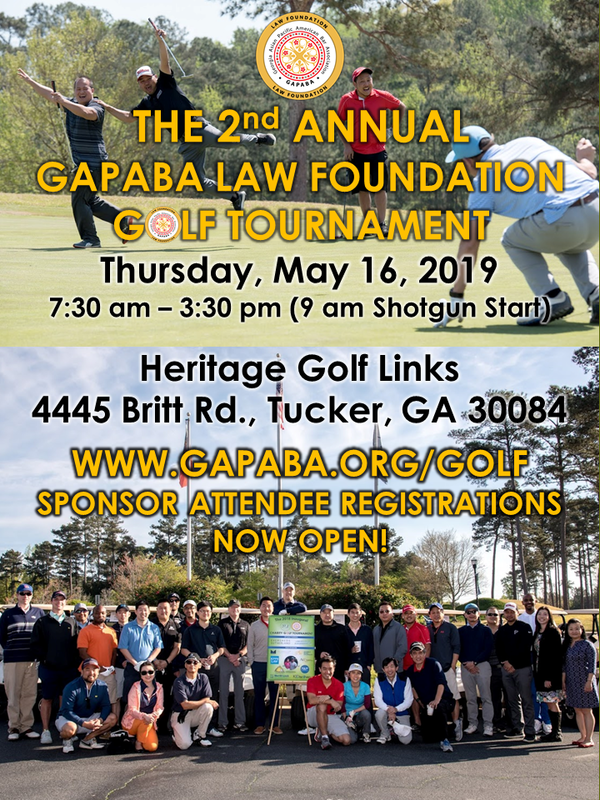 10/04/2018 GAPABA's 2nd Annual Legal Network Auction! 08/18/2018 #GAPABAVolunteers: Saturday Lawyer Program with AVLF! 07/24/2018 GAPABA SSF JULY HAPPY HOUR! 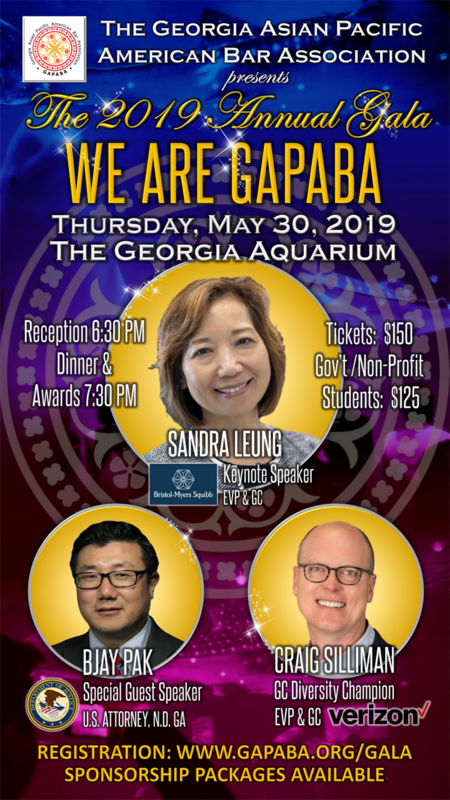 07/12/2018 2018 Gala Volunteer Appreciation Dinner! 06/23/2018 #GAPABAGives for ServiceJuris Day 2018! 06/10/2018 #GetYourYogaOn! GAPABA WLN presents SUP (Stand-Up Paddleboard) YOGA! 05/19/2018 #GAPABAGives: Volunteer for Citizenship Clinic! 04/13/2018 NAPABA SE Regional AFTERPARTY: Karaoke for a Cause! 11/05/2017 #TeamGAPABA goes to #NAPABA2017! 10/14/2017 #TEAMGAPABA joins #TEAWalk2017 at CPACS! 09/20/2017 GAPABA's Inaugural Legal Network Auction! 08/24/2017 GAPABA SSF HOPPY HOUR at HOPSTIX! 08/17/2017 Gala Volunteer Appreciation Dinner! 07/29/2017 GAPABA & ServiceJuris Join Forces for Community Service! 01/12/2017 GAPABA Launches the Solo & Small Firm Group! 11/03/2016 #TeamGAPABA goes to #NAPABA2016! 10/08/2016 #TEAMGAPABA joins #TEAWalk2016 at CPACS! 09/08/2016 GAPABA Mentoring Mixer: All Welcome! 06/26/2016 2016 GAPABA Tailgate Party: Atlanta Braves v. New York Mets! 06/18/2016 GAPABA & ServiceJuris Join Forces for Community Service! 06/12/2016 Gala Volunteer Appreciation Event: Featuring Chef Sean Rosario & Raj's Pool! 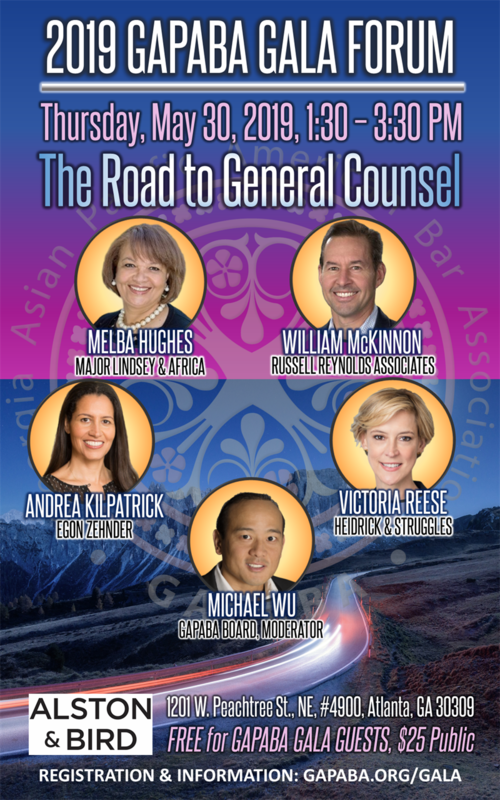 11/05/2015 #GAPABA goes to #NAPABA2015! 10/10/2015 #TEAMGAPABA joins #TEAWalk2015 at CPACS! 06/07/2015 GAPABA Tailgate Party: Atlanta Braves v. Pittsburgh Pirates! 03/26/2015 Inaugural GAPABA Young Lawyers Division Happy Hour!